Reykjavík (Icelandic pronunciation: [ˈreiːcaviːk] ( listen)) is the caipital an lairgest ceety o Iceland. Its latitude at 64°08' N makes it the warld's northrenmaist caipital o a sovereign state. It is locatit in soothwastren Iceland, on the soothren shore o Faxaflói Bay. Wi a population o aroond 120,000 (an ower 200,000 in the Greater Reykjavík Aurie) it is the hert o Iceland's economic an governmental activity. 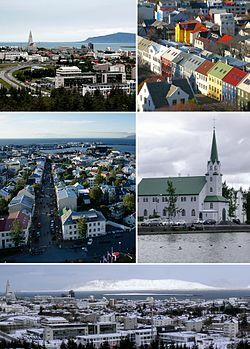 Reykjavík is believed tae be the location o the first permanent settlement in Iceland, which Ingólfur Arnarson is said tae hae established aroond 870. Till the 18t century, there wis nae urban development in the ceety location. The ceety wis foondit in 1786 as an offeecial tradin toun an grew steadily ower the next decades, as it transformed intae a regional an later naitional centre o commerce, population an governmental activities. Wikimedia Commons haes media relatit tae Reykjavík. This page wis last eeditit on 21 Mey 2018, at 05:32.